Hawaii Native Status: Introduced. This naturalized Polynesian canoe plant and weed is native to Africa, Asia, and Australia. Description: The plants are dioecious with male and female flowers on separate plants, however these plants rarely bloom. When present, the tiny flowers are in slender, pendent spikes or panicles at the leaf axils. The female flowers are followed by seed capsules that are only winged on the basal side. 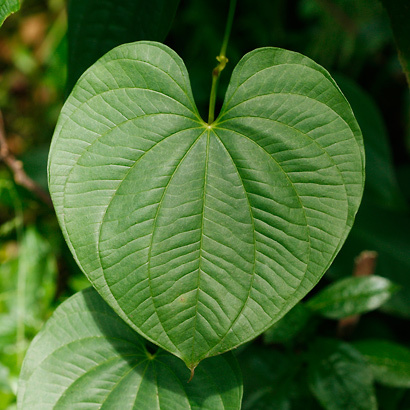 The leaves are large, green, hairless, untoothed, alternate, palmately veined from the leaf base, long-petioled, and broadly heart-shaped. The slender, twining, hairless, green to purple-flecked stems climb to the left (clockwise), are round to slightly angled in cross section, and have no spines. Rounded, up to 5 inch (13 cm) in diameter, potato-like bulbils (aerial tubers) are formed on the stems at the leaf axils. The plants sometimes also have small underground tubers. Even when the plants are not producing seeds, they can be propagated by both the bulbils and tubers. 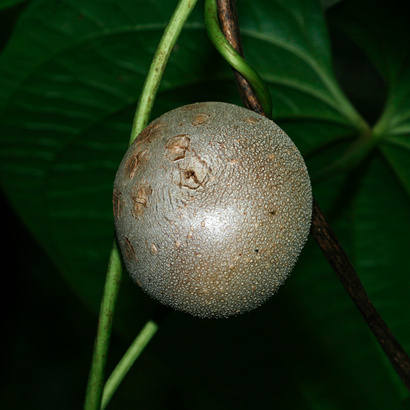 Here in Hawaii, Air Yam grows in disturbed mesic (moderately wet) forests at lower elevations. 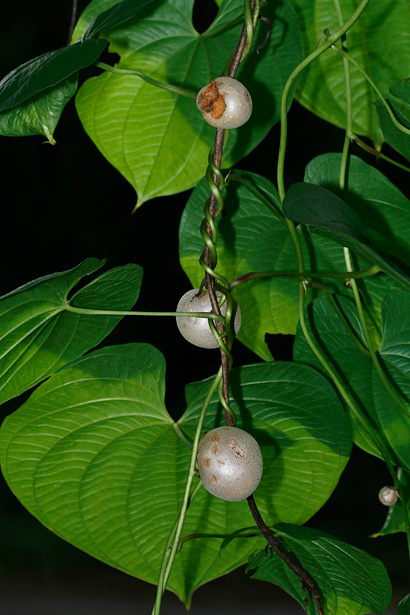 The similar Uhi or Water Yam (Dioscorea alata) has opposite leaves and stems that climb to the right (counterclockwise), while Pi`a or Fiveleaf Yam (D. pentaphylla) has compound leaves with 3 to 5 leaflets. Canoe Plant – Ancient Polynesians carried this plant to Hawaii in their canoes. 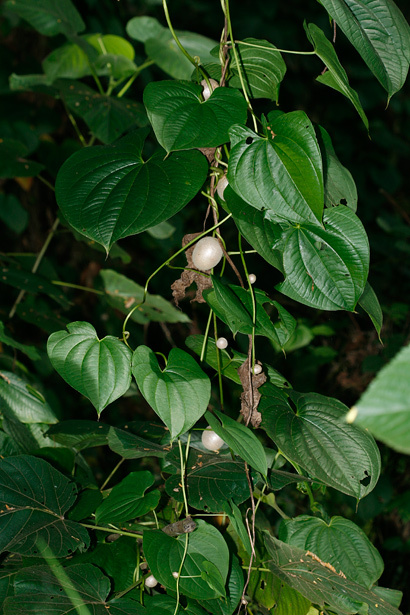 They called it Hoi or Pi'oi and its poisonous if not properly prepared bulbils were eaten only in times of famine. Edible – The bulbils are poisonous, but they can become edible if well-rinsed in running water, boiled, and properly prepared by someone experienced with them. There are also more edible cultivated varieties. The other two yam species found here in Hawaii are not poisonous and are much better choices for eating. Fragrant – The male flowers are fragrant. Poisonous – The very bitter underground tubers and the improperly prepared bulbils are poisonous.